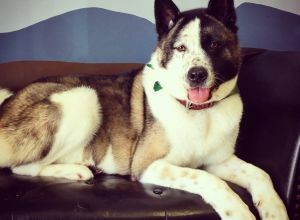 Naru | Akita à Montreal. Naru doesn't like other dogs but he is a real puppy with humans. Very cuddly and friendly, easy on the leash, will stay by your side as you walk, and with the Parc Lafontaine nearby it's a great walk to do! Naru and I went for a one hour walk around Parc Lafontaine. He really is an amazing dog, he's easy on the leash and very gentle, he's also got a super soft fur. I love when he jumps around like a puppy! Akitas are the best.